See what my team is up to now. We'd love to have you as a team member, too. Click here to become one, or contact me for more details. There's also a tab on this page that will give you information about the Avon business. I had to deliver my spring fundraiser order to various places in Huntsville today and take care of several other deliveries from C10 orders after that, but I'm staying up late to get this newsletter out as promised. The Cloud Climbers also grew by two new team members today, and I'll have more to say about them in the next newsletter. Congratulations to Jessica Martinez for making the Top Ten for our team in her first Avon campaign, and for getting 40% earnings on her order as well as a packet of samples. Great work, Jessica! 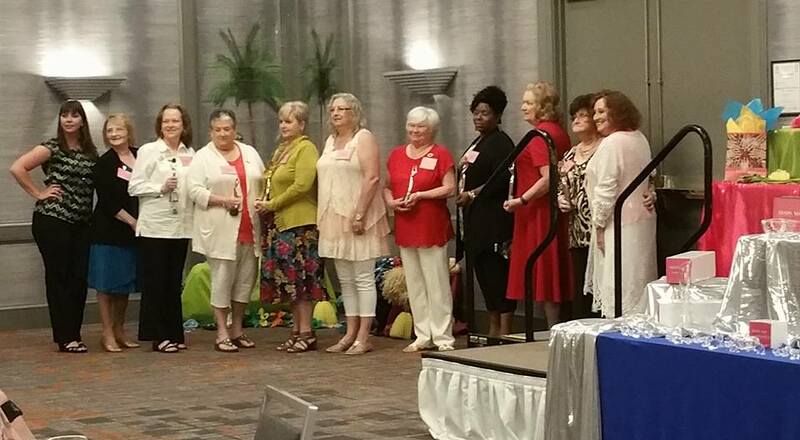 I took a look at Carolyn King's Facebook Business page today (or was that yesterday?) and "Liked" it. I can't remember if I have seen business pages for any of the rest of you. If you have one, please let me know or invite me to like it. Carolyn's page was recommended to me in the side bar as I was doing something on FB, and I think that was the first time I knew about it, although she has had it going for awhile. In fact, I saw some pictures she had used that I don't remember seeing before, so maybe I need to hear some tips from her. Speaking of which, I was already planning to ask in this newsletter that some of you who work full time jobs (like Carolyn) in addition to your Avon businesses, give some tips that I can share with the other Cloud Climbers in a future newsletter. I have never worked a full time job while being an Avon Representative, so I haven't had to coordinate the two. Let us know what things work best for you, who you sell to, are you allowed to sell at work, etc. Those celebrating May birthdays are: Ruby Nunnery (5/20), Steffanie Erdelt (5/27), and Jessica Martinez (5/29).Avon Anniversaries being celebrated are: Maria Loza (5 years on 5/9), Yvonne Lassiter (15 years on 5/19), and Darren Mannahan (4 years on 5/19). Receiving an Avon Award recently was Steffanie Erdelt. She is now a PRP Contender and received 100 points added to her account. There were three Cloud Climbers with Direct Delivery sales in C10: Kristi Strode,Virginia Washington, and Darren Mannahan. Keep promoting your eStores, because you never know when someone may decide to order in that way and you want all your customers to know their options. One of our Cloud Climbers discontinued her business and went back to being a customer of mine a few months ago and I was quite surprised when she let me know she did not know how the Direct Delivery system worked. That means that the entire time she was selling Avon, she was not promoting her eStore to her customers, even though I have always encouraged it. Now that she is not selling, she is finding that Direct Delivery is her preferred choice for ordering. And we now have a great new Social Media App that lets you post to your preferred Social Media very easily. If you haven't taken a look at it, please do. You can post from your computer or your phone. You may have seen this info in an email from your DSM, but I want to make sure you know about it. If you take credit or debit card payments from your customers, you no longer have to submit the paper credit card forms to Avon, saving yourself a stamp. This is a blessing to me, because I have often been lax about getting those forms sent in promptly, which is not good business practice. Now we can just call FAST Talk (the number is on your invoice), and say "Make a payment" or press 2. Make sure you have all the information you need: CC number, expiration date, security code from the back, billing zip code, and payment amount. 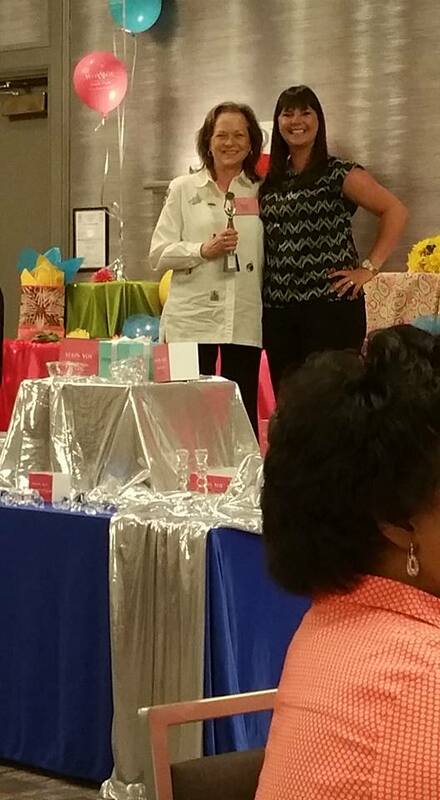 Rene Parker and I enjoyed a great PC Tribute at the Marriott on Tuesday of this week. Unfortunately, I forgot to get a picture of Rene at the tribute, an oversight that I have already apologized to her for. You may have seen some pictures from the tribute already if you are on the FB page for our district, but many of you don't use Facebook and some are not in our district, so here are just a few pictures. I was pleased to receive two Silver awards for second place in Sales Increase and second place in Total Sales for District 1139. I think next year's tribute will be even better than this one, and I hope to see more of you there. All you need are total sales of $10,000 in one year, so push toward that goal and join us next year! 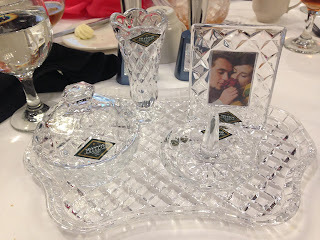 Three of us at our table won door prizes, and mine was the crystal dresser set in one of the pictures. 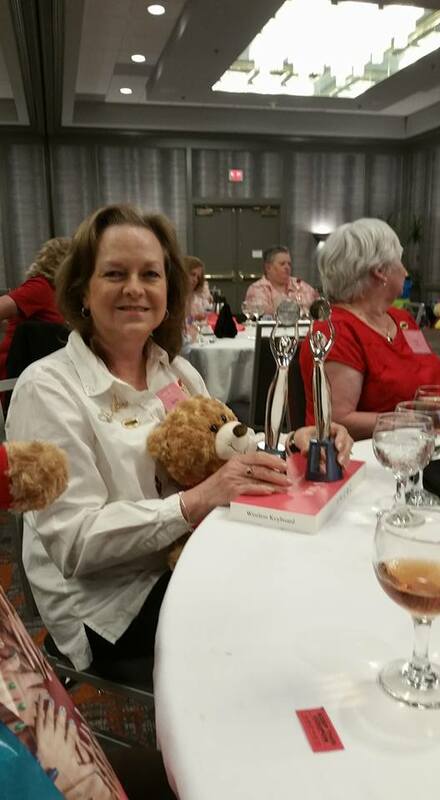 As you can see in the pic of me holding my trophies, I have the wireless laptop under them. That's because the three of us traded our gifts around and I got the wireless laptop to use with my iPad mini that I earned from Avon a couple of years ago. Yay! The other gift traded was a set of nice headphones. We had "Let's Make a Deal" going on for awhile there and everybody ended up happy!